This is a super healthy baked pasta recipe. It’s full of colorful and healthy vegetables plus wonderfully fragrant herbs. See my suggestions below for making this already healthy dinner recipe even more healthy. Preheat the oven to 450ºF or 230ºC. In a large shallow baking pan, toss together the red and yellow peppers, mushrooms, zucchini, eggplant, garlic and olive oil. Spread the vegetables out and roast in the preheated oven for about 25 minutes or until softened, stirring once or twice. Season with salt and pepper to taste. Stir in 1/3 cup parsley, the basil and the rosemary. Meanwhile, cook the pasta until tender according to package directions. Drain well. Gently combine with the spaghetti sauce, cooked vegetable mixture, mozzarella cheese, Fontina cheese and half of the Parmesan. Transfer it all to a shallow baking dish. Sprinkle the pasta mixture with the remaining Parmesan cheese and parsley. Cover the baking dish with foil and bake in a preheated 375ºF oven for 30 minutes. Uncover and bake for 10 to 15 minutes longer or until the baked pasta is nice and bubbly. There are a couple of ways I would suggest that you can make this recipe even healthier. One of them is to use whole wheat pasta. Whole wheat pasta has more fiber in it than regular white pasta. It may take some getting used to and I always suggest that when you use whole wheat pasta you really do need to cook it well. It doesn’t taste that great when it is ‘al dente’ or slightly firm, as you would cook white pasta. Cook it fully and add plenty of salt to the water when you are boiling the pasta. Pasta water should always be well salted. The other way I would suggest to make this recipe even healthier is not to use pasta at all. Make the sauce and serve it over something like cooked quinoa, amaranth or even brown rice. 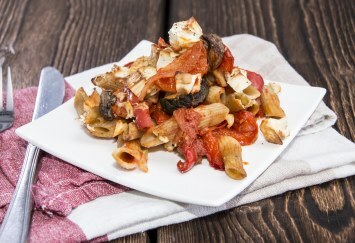 Change it up a bit, so pasta is not always the standard ‘go to’ starch in your dinner. If you want to lessen the fat content, omit some of the cheese. As an example, use the mozzarella and Parmesan but omit the Fontina cheese. I have already cut much of the mozzarella cheese called for in the recipe as it was given to me. Use more if you prefer. The original recipe called for 3 1/2 cups of mozzarella. I use about 1/2 of that plus the Parmesan. It’s plenty for me. The high sodium content in the nutrient content figures above is almost completely due to the spaghetti sauce. The calculator I used assumes you are using canned or jarred spaghetti sauce which can be much higher in sodium than what you would make at home. If you are using homemade pasta sauce, don’t worry about the sodium content. It will be just fine. Don’t worry about the high level of potassium. That’s a good thing. It’s like eating a few bananas at one sitting. The carb content is from the pasta. And all pasta dishes are high in carbohydrates. Using quinoa cuts that down. Here is another baked pasta recipe – baked penne with Italian sausage.